There are lots of reasons to know which essential oils are great at healing the skin and helping scars to disappear. When one of my kids gets a gash that is healing with a scar, it would be nice to know what can painlessly help (though my boys are no doubt proud of that scar). That spot from chicken pox, a burn, or some other injury; the deep burns take time and even then some cannot be healed perfectly, but there’s definitely some help that we can give ourselves and our children through essential oils used wisely and carefully. Helichrysum, also known as the Everlasting Oil, is the most talked about essential oil when it comes to reducing scar damage. It is crazy expensive, so you may want to try other oils first. But some may see it as worth it when it comes to those difficult scars on the face. 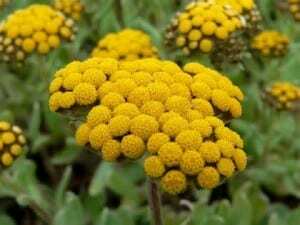 Here’s a link to some good quality Helichrysum. There are less expensive brands, but most are not as potent. This must be diluted in a carrier oil. Carrot Seed and Frankincense essential oils are by far my favorites. I use them in my anti- wrinkle serum and they are extremely effective. They must be diluted in a carrier oil such as apricot kernel oil, jojoba, sweet almond, or even olive oil. Lavender is a very gentle essential oil that you can use on your children’s skin without diluting if careful. It is soothing and great for acne, scars, and most skin conditions. Rosemary is a very cleansing oil. It helps the skin cells to detoxify, cleanse, and regenerate. Calendula oil is used in my Homemade Antibiotic Ointment due to its great healing properties. It is anti-inflammatory, an antiseptic, and an antioxidant. The Complete Book of Essential Oils and Aromatherapy: Over 600 Natural, Non-Toxic and Fragrant Recipes to Create Health – Beauty – a Safe Home Environment by Valerie Ann Worwood. Use rosehip and apricot kernel as carrier oils (or some other combination) and as many of the following essential oils as you desire. Apply to scar at least twice daily. Add 2 more ounces of carrier oil to this recipe if using with children. Please do your own research, especially if using if pregnant or using on children. A number of you have used this recipe over the years and have told me personally of the results. I’d love for you to add your testimony in the comments below. Also, I’ve just started offering this Blend in my Shop. I know Helichrysum is very expensive. Since I’ve taken the plunge to purchasing some, I’m able to put it together for you in a blend at a cheaper price so make sure you check that out too. Thanks for sharing this recipe. Will share on pinterest & google. I love using essential oils. Visiting from Wildcrafting Wednesdays. Have a wonderful healthy day. Thanks! I’m pinning this one. We have scars around here with a houseful of boys, lol. Great post, thanks for sharing! Love your scar recipe, I am waiting the shipment of my rosehip oil to make a face serum so I will be adding this to my project list. Great! I just started working on a line on my arm from Thanksgiving that’s still there. We’ll see how it goes. Great tips! I have lots of scars and skin issues due to Lupus, food allergies, etc. I like the idea of using calendula and was planning on including that in the garden this year. I also have a variety of oils and EO to play with, and like your suggestions. Visiting from LWSL. Two posts about helichrysum this week. The stuff is magical. Thanks so much for linking up to Oil me up Wednesdays at My Lamp is Full. I appreciate your posts each week. Hope to see you tomorrow. I always prefer to use natural products as opposed to commercial ones that are packed full of god knows what. Thanks for the very informative and interesting post. Thanks for linking up to Sweet and Savoury Sunday, stop by and link up with us again this weekend, I’d love to see you there 🙂 Have a great weekend! 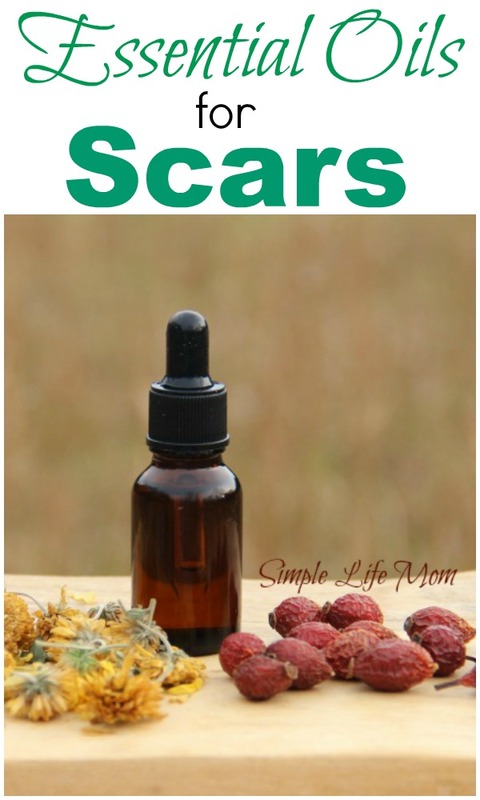 Since childhood I have suffered from unattractive scars that have lasted for years in some cases, so I am delighted that you shared this natural remedy for scars using essential oils at the the Healthy, Happy, Green & Natural Blog Hop! I appreciate it! I love using essential oils. I have all of these except the Helichrysum. I’ll still give it a go! I’ve been looking for something to give to my daughter to reduce an scar from acne. How is your daughters acne scars since using the essential oils ?. My daughter aslo has severe acne scars and we are looking for something that works. We don’t have acne scars here, just wound scars mainly on my boys. It works, but you need to be consistent and it takes time. Scars definitely don’t heal overnight, but you can see a difference pretty quickly. How much carrier oil is used in this recipe? Can’t wait to try this on some recent surgery scars! 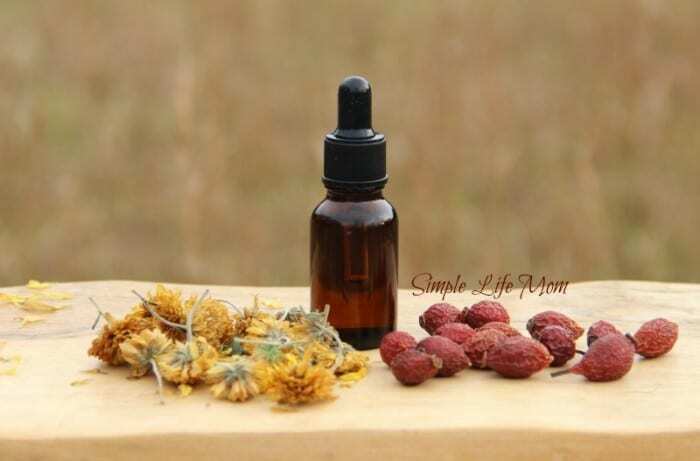 It has one ounce of apricot kernel oil and one ounce of rose hip oil (sometimes referred to a an essential oil, though it has no scent of its own). Would you ever sell this in your shop? I would love this to help with scars but can’t reallly afforrd all of the oils. I don’t want to leave any out as synergy blend sounds perfect. I also have read that tamanu oil is great for skin. What do you think of this oil? Thanks Kelly! I will definitely keep it in mind. I can’t afford the Helichrysum right now, and it’s a key ingredient. It’s very powerful. Sounds like my issue. If any other readers are interested in the scar blend being available from your shop in the future, they’ll let you know. Im sure you would want to see a big interest before investing in an expensive oil. I will keep watch. What is your opinion on tamanu oil? I’ve been reading here and there its healing for skin issues. You are right that there has been a lot of studies saying that it is a skin healing oil. I would definitely give it a try on damaged skin. Hello. Thank you for the information. I am a soap maker and I have a new customer that has Ehler Danlos syndrome. Would your mix work well in a melt and pour soap solution? I do not make melt and pour soaps because I having found any where I approve of the ingredients, so I’m not certain. But since there is no lye and the heat is not extreme, then the essential oils may survive the process a lot better. Do you sell your scar formula? Helychrysm is extremely expensive so I cannot offer it in my shop at the moment. Would this formula also be effective for an injury involving fracture and bruising with inflammation if there is no broken skin??? Yes, these are great oils for that type of injury, especially the Helichrysum. My partner was in a serious auto accident and was left with deep gashes on her face. I made this scar treatment and she started using it faithfully twice a day. It has been three months since she started using it, and slowly but surely the scars have lost all color and are becoming less noticeable each day. She will continue to use it — we know this is a long process — but one of these days we will look and the scars will be gone! Thank you Kelly. You are a blessing! This recipe looks fantastic! How should I adjust the oils if I’m going to add enough beeswax to make a twist up stick? Will the beeswax block the absorption of the essential oils? You can use a lip balm recipe and add the essential oils to help heal scars. The beeswax will not stop the absorption of the essential oils. I am making your formula for a burn scar and wanted to let other readers know that Ananda Apothecary offers each of these oils in a sample size ranging from $2-$4 each. I have no financial incentive for posting this; I just hope this helps other reader to be able to afford this blend. Hi Kelly, I was thinking about this treatment, something I may look into trying, I was wondering if it can be used for large areas, like old stretch marks? it would be awesome to see them slightly reduced Or at least worth a trying. Also, In large to treat areas like legs/buttocks/tummy etc…. Is it ok to add a couple more drops (of a Carrier oil) at home, to this scar treatment oil (On each application) to help it spread easier across the larger parts of the body? I had a lumpectomy five months ago and have a seroma–fluid pocket surrounded by scar tissue–and although it has shrunk a good deal, it seems to have hit a plateau. It’s still about the size of a half dollar. Do you have experience with the scar oil dissolving scar tissue below the skin and helping a seroma to be reabsorbed? I’ve read that Helichrysum is the most important ingredient for scar tissue. Can the amount of Herlichrysum in your scar oil be increased (even if this means a price increase) so that it is the primary ingredient? Would this oil last for three or four months? Please advise. Yes, just always test on your wrist first for any allergic reaction. Will this serum be safe on a 6 yo?My super skinny girl gets scars from the tiniest scratch.Years later and are still all over her face.Just recently got a new one on her nose, from just a simple scratch, that came from her younger sister’s nails.The small line on the bridge of her nose turned pink. Tried vit e and broke into a rash all over her face.Also,can I use tamanu oil instead of apricot kernel? You can use tamanu oil instead of apricot kernel oil. You’ll first need to dilute the recipe in half for her. Then you’ll need to patch test it on her wrist to see if she has a reaction. If she had a reaction to the vitamin e oil she may be very sensitive. It depends on the quality of the vitamin e oil you used. thanks for sharing your recipes. All your recipes are awesome. Will try and let you know the result. My daughter is having black spots in her hands and legs because of mosquito bites. She is 15 years old. Can i use this recipe for her , Pl advise.